If you haven’t seen “The Great Gatsby” I highly recommend it. After watching it I actually regretted never having read the book. I was supposed to read it in high school but after reading a page or two I opted to read the cliff notes instead. It’s probably one of the few cliff notes I have ever read as I have always enjoyed reading, but that was just one book that was impossible for me to get in to. I thought for a second of reading it now but that regret soon subsided as my previous sentiments were validated by many… the book is boring. Baz Luhrmann apparently took some liberties in adapting the book to the big screen. 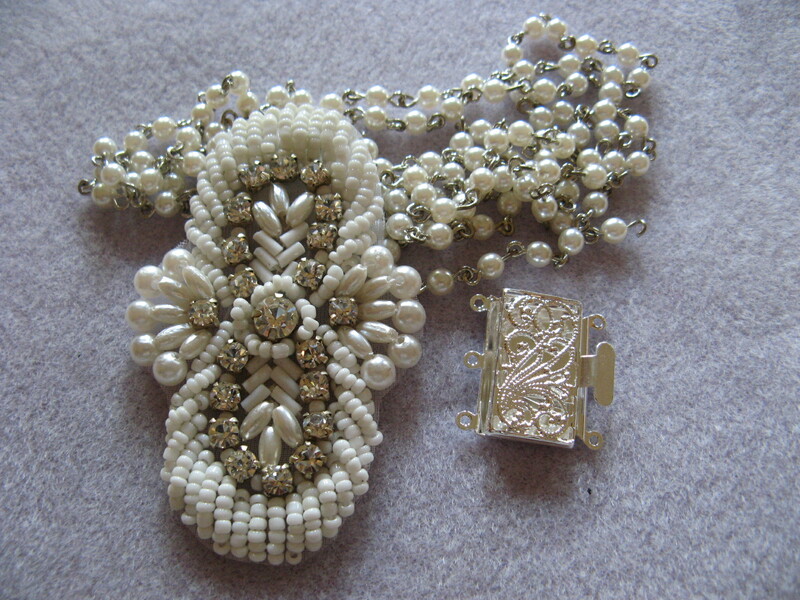 The movie has inspired a new wave of fashion trends especially in jewelry. Just check out the new collection from Tiffany’s, which is gorgeous but out of most peoples price range. I suppose jewelry made by the company 1928 Jewelry will be experiencing a surge in sales now as it’s a little more affordable. The jewelry from that era was more like pieces of art more than anything else. 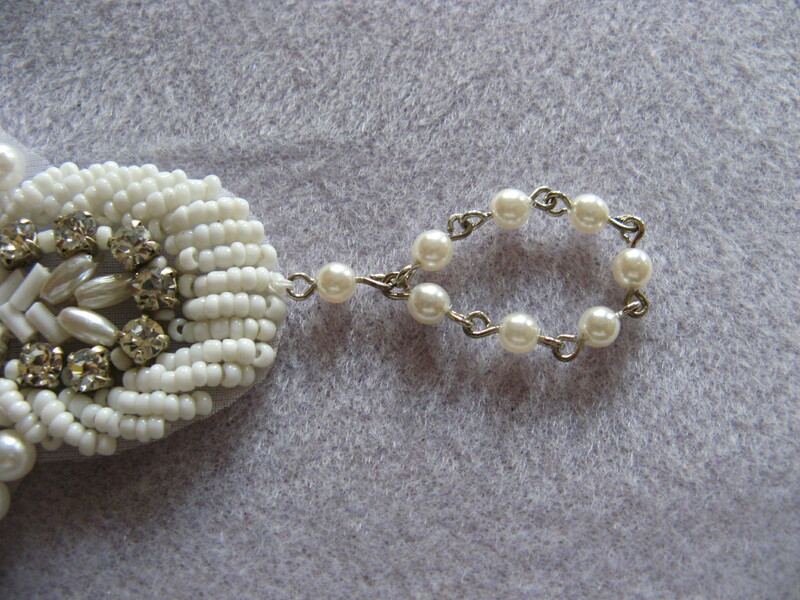 A friend of mine came across a bracelet/hand ornament on M&JTrimming’s blog that was inspired by the piece Carey Mulligan’s character Daisy wore in the movie that she liked and asked me to recreate. 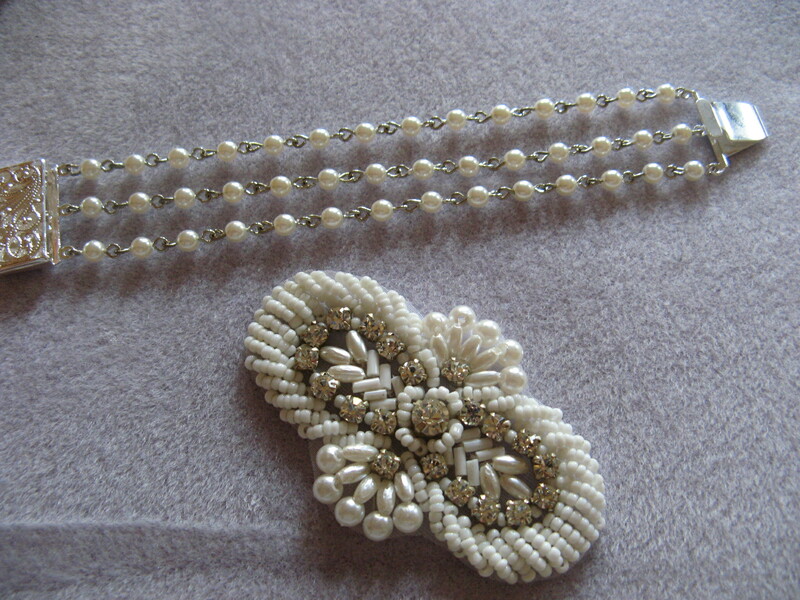 The supplies: a yard of pearl rosary chain, a pearl and rhinestone applique and a clasp. To begin I made the actual bracelet part first. 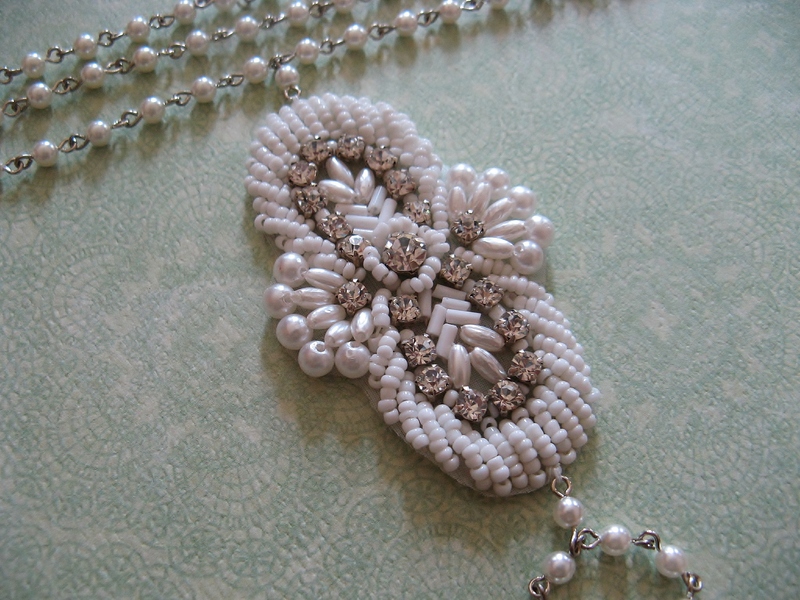 Since the pearl rosary chain is connected by interlocking eye hooks I was able to connect the chain to the clasp without the use of jump rings which gave it a much cleaner look. 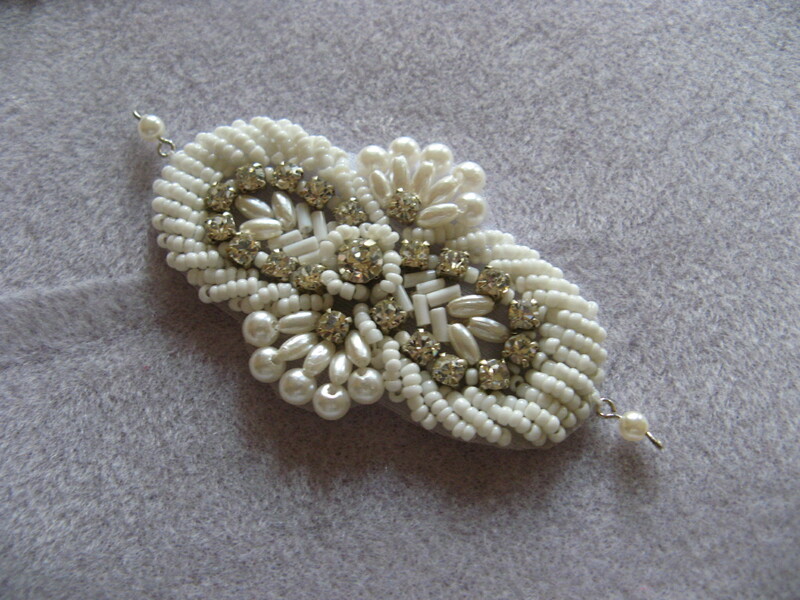 Next, I used fireline to sew one section of pearl chain to each end of the applique. I then made a ring with some of the chain and attached it to one end of the applique. 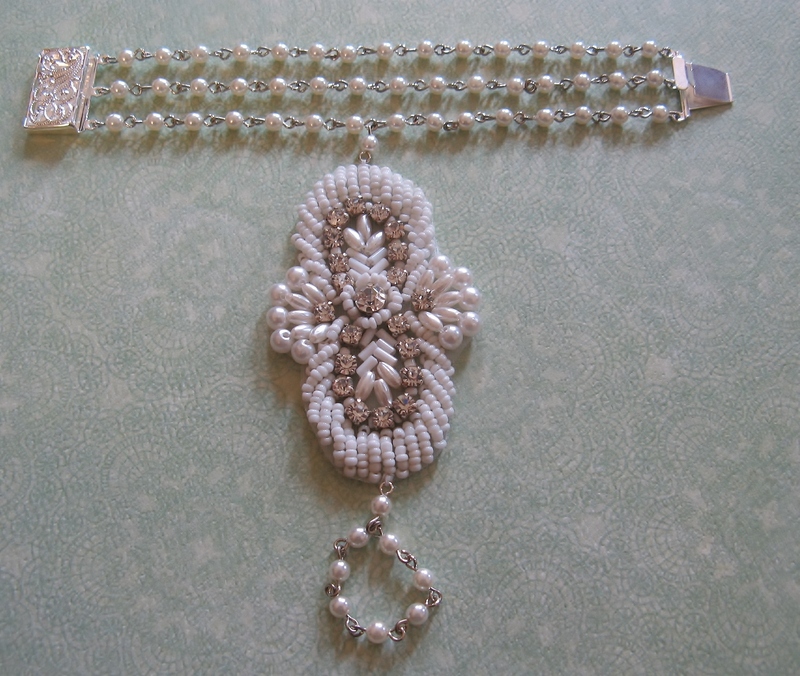 I then attached the other end to the bracelet and voila, as simple as that a Great Gatsby inspired bracelet. It looks very nice, I really admire your patience. Thanks for stopping by and for always visiting my blog. I really appreciate. Have a wonderful week. How was Memorial Day for you? lots of wine? BBQ? what do people do? Thanks Liz! Memorial Day was nice and relaxing. It’s the unofficial to start to summer so if the weather is nice people usually head to the beach and yes, many people BBQ. By me the weather wasn’t that great on the wknd so the sun and warmth today were greatly welcome!